The 1980s is a period of success and variety for Palin the writer, but with hard slog balanced by what Palin feels to be a sense of drift, claiming to be ‘a lazy writer’9, as he is worn down by struggles to finance projects such as American Friends (1991), and experiences moments of ‘typewriter fright’10 including a lovely moment of writerly self-deprecation in 1980 that could slot alongside Oscar Wilde or Jerome K Jerome: ‘Tried to write a startlingly new and original, brilliantly funny and thought-provoking piece for Python. Did this by staring out of the window, playing with paper clips and shutting my eyes for long periods.’11 Despite the floating of new ideas (including John Cleese’s rumination on a new Python TV series in an impromptu meeting in Hull), Python here moves from a writing job to a business management task, a reference point for critics and fans, or a source of bemusement as real-life people behave more oddly than most Python inventions. The most important legacy is friendship amongst the Pythons, which shines through in collaborations and social meetings, recorded – despite memorable comments on Cleese’s financial motivations and lack of pop culture savvy – with warmth and generosity. Palin the actor is also introspective, as he craves different kinds of roles – the cancellation of Troubles deprived him of this, but the next volume can pick up his chance to stretch himself as a dramatic actor in Alan Bleasdale’s superlative G.B.H. (1991)12. Although a key face in hugely successful films in the 1980s, Palin (as the volume’s title suggests) settles on writing ‘little’ films as ‘more rewarding’ than ‘doing a “cameo” for some American film’13, an attitude which is strikingly different from that demonstrated by Eric Idle and John Cleese elsewhere in the diaries. Palin details several Hollywood films which he either rejected or did not get. Indeed, he sees A Fish Called Wanda as ‘one I shall do for money, rather than love’14, until its efficient organisation and inclusive production process engagingly fire his enthusiasm. The Wanda section is particularly lovely, and even disquiet with Kevin Kline’s intensity is drawn with characteristic affection or wit: ‘even when he’s done the most brilliantly inventive take he stands, shrugs, and looks like a man who’s just been given a tin of contaminated beef’15. In encounters with everyone from random bypassers to Spike Milligan and Peter Cook and other noted diarists such as Lindsay Anderson and Alan Bennett, Palin’s descriptive powers are increasingly sharp. He is also aware of post-Python comedy trends, including an amused experience of the BBC incorporating alternative comedians (whose early work Palin attends) into the establishment. Both volumes so far have been informative, entertaining, surprising and thoughtful, and are typically Palinesque: a superb achievement marked by understatement and skill. 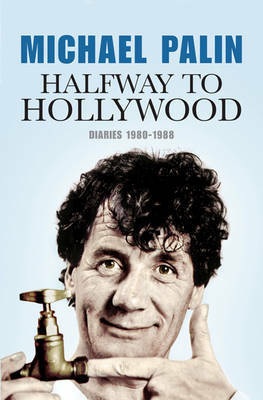 Michael Palin, Halfway to Hollywood: Diaries 1980-1988 (London: Weidenfeld & Nicolson, 2009) is available now in hardback. Originally posted: 4 January 2010.